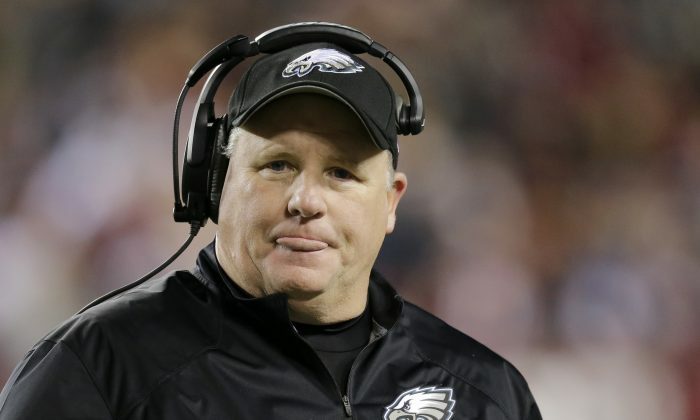 Philadelphia Eagles coach Chip Kelly is clearly on the Marcus Mariota bandwagon. Has been for years. And why shouldn’t he be? Mariota’s the reigning Heisman winner and Kelly has a personal connection with him. After all, he recruited him to Oregon, put him in the starting lineup (as a freshman), and together they beat Kansas State in the Fiesta Bowl. Days later Kelly left for the Eagles. In the interim Kelly, unlike Nick Saban, Steve Spurrier, Butch Davis and many others, has proven that his college coaching success carries over to the NFL (20–12 record in two seasons). In addition Kelly has won a power struggle in the front office and now will be able to call the shots in the war room. It’ll just be in the nick of time too as the Eagles have some big decisions coming up—especially at the quarterback position. With Mark Sanchez’s struggles and Nick Foles’ injuries, Kelly needs an upgrade at the quarterback position. Now that Mariota has declared for the draft reports have Kelly and the Eagles, who own the 20th pick overall, looking to trade up and select him, according to a report on NJ.com. It won’t come cheap though. That’s probably an understatement. At this point, well before the scouting combine and interviews have taken place, Mariota is generally considered to be a top-five pick—if not top two as both Tampa Bay and Tennessee (who will pick 1-2 in the draft) are in need of quarterback help and Mariota as well as 2013 Heisman winner Jameis Winston look to be the top quarterbacks available. A lot can happen between now and the NFL Draft in late April. Just look at last year as Johnny Manziel’s stock tanked leading up to the draft. But while Manziel had a number of off-the-field issues, Mariota’s reputation is squeaky-clean. Supposing he doesn’t pull a Manziel and fall into the eagles lap at pick number 20, what would it take for them to trade up into the second spot? Using Jimmy Johnson’s now-common draft pick value chart, the second overall selection is worth 2600 points (number one is 3000). Meanwhile the 20th is valued at 850—a difference of 1950 points. For perspective their second round pick (52nd overall) is valued at 380 points, while their third-rounder is worth 170. With a mid-first round pick (number 16 overall) valued at 1000 points, it’s likely the Eagles would have to surrender their first rounder in 2015 (850 points) as well as two future first-rounders to make the deal work. Would the Eagles do it? Do these deals ever work out? Sometimes they do, sometimes they don’t. In 1983 the then-Baltimore Colts traded the number-one overall pick (worth 3000 points) to the Oakland Raiders for the fourth overall pick (1800) and a first-rounder in 1984, which turned out to be the 19th pick (875 points), as well as backup quarterback Mark Herrmann (??). Though the Colts did alright with the two lineman they got from those picks (Chris Hinton and Ron Solt) Elway led the Broncos to five Super Bowls. In 2012 the Washington Redskins traded their first rounder (sixth overall, valued at 1600 points), a 2013 first rounder (22nd overall, valued at 780), a 2014 first-rounder (2nd overall, valued at 2600), as well as a 2012 second rounder (39th overall, valued at 510 points) to the St. Louis Rams, to get the draft rights to Robert Griffin III, the second overall pick in 2012. It’s safe to say that the trade hasn’t worked for the Redskins.